Welcome to the Office of the City Manager. I am delighted you have taken time to visit and hope the information presented to you will be helpful. In this age of technological advances and the need to access information quickly, you will find this site provides contact information and answers to common questions. In addition, links are also given to other pages on the picayune.ms.us website as another office may be able to provide the assistance you require. We welcome any comments or suggestions you may have pertaining to the site, as its contents have been provided for your convenience. 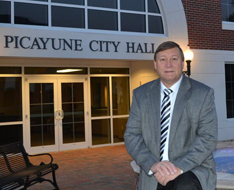 The City Manager is appointed by the Mayor and City Council to manage the day-to-day operations of the City. As the chief executive officer for the City, the City Manager is responsible for all functions of the city and manages these functions through the respective departments. Under the Council – Manager form of government, the City Manager is responsible for carrying out the legislative policies passed by City Council and for providing recommendations to Council on municipal affairs with an emphasis on effective, efficient, and equitable service delivery.